Lazy Kaslowyn is an Imperial beggar living in Chorrol. His bedroll and food sack can be found southeast of Modryn Oreyn's house. He lives the typical life of any beggar, waking up at 6am and heading to the front of the Chapel of Stendarr, where he will beg for food and money for four hours. At 10am he will change his location, this time begging in front of the inn The Oak and Crosier until 2pm. At that time he will take a few steps back and will stroll around in the alley in front of Renoit's Books for four hours more. At 6pm he will head back to his bedroll, wandering near it until he goes to bed at 10pm. His attire consists of a stitched green shirt combined with sack cloth pants. 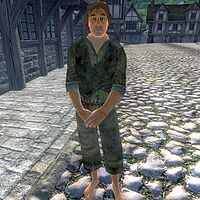 As a beggar he doesn't have access to weapons or spells, relying on his bare fists during combat. You can contract the disease Swamp Fever from him. He can give you clues on how you find the Thieves Guild and is also one of the "poor and suffering" to whom you must speak in order to receive speechcraft training from Tandilwe. He, along with Nermus the Mooch, only has an Al package to find food, not to eat it, even if there is food in his sack, thus he will just stroll near his bedroll until his bedtime. This page was last modified on 9 April 2013, at 08:47.